Two captivating articles caught my eye today: one on the biotech giant Monsanto; the other on VISIONS, what we can do, from AlterNet on the web. I hope the following article in Vanity Fair is long but worth the read. I hope it makes you mad. I hope it makes you see how chemical companies have lied and poisoned this planet: all of us! The second article was written on the website, Alternet which pushes the envelope (a good thing!) in alternative journalism. It gives us all hope. A new radicalism is needed and the author hits the nail on the head. A good read! Categories: Chemicals/Pesticides in Your Food, Food, Food & Your Health, Food Politics, Freedom of Speech, Health | Tags: Agent Orange, biotech, dairy farms, dioxin, Environment, Family, farms, food, GMO, GMO foods, Health, lawn care products, milk, Monsanto, news, Occupy, PCB, Politics, small farmers | Permalink. The largest chemical company in the world, BASF, has decided to move out of Germany. Opposition to their GMO seeds was so great that the company decided better pickings were – where else? – in the United States! As if we don’t have enough problems battling Monsanto and Dow with chemicals and GMOs! To be sure, this will be a cause for vigilance against these companies who are determined to have their genetically modified way! 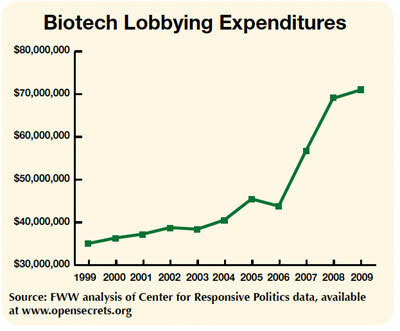 Lobbying by chemical and biotech giants has taken a tremendous jump in the last 5 years. Back in 1999, a paltry $35 million was spent. According to the data available at OpenSecrets.org which tracks money in politics, in 2006 funds spent for lobbying was about $43 million. 2007 was around $57 million; 2008 was just about at $70 million. 2009 showed slowed growth at a hair over $70 million. Clarence Thomas, Supreme Court Justice & former Monsanto lawyer who did not recuse himself in a recent case involving his former employer. Islam Siddiqui, former pesticide lobbyist for CropLife America, currently the lead Agricultural Negotiator for the U.S. Office of Trade – despite record opposition to his appointment. Roger Beachy, founding president of the Danforth Plant Science center (Monsanto’s de facto nonprofit research arm), currently heads the USDA’s National Institute for Food & Agriculture. Michael Taylor, former Monsanto lawyer & Vice President for Public Policy, currently serving as at the FDA. Taylor is famous for having engineered the U.S. government’s favorable agricultural biotechnology policies during the Clinton administration. Elin Miller, former heard of Arysta’s North American division, installed by George W. Bush as head of EPA’s Region 9 Office. Arysta is the largest private pesticide company in the world, and sole producer of methyl iodide. Organic Consumers has another list of biotech meets government. Categories: Food, Food Politics | Tags: BASF, biotech, Clarence Thomas, FDA, Islam Siddiqui, lobbying, Michael Taylor, Monsanto, news, political contributions | Permalink.